Arianna Coe has devoted the past 9 years to mastering SomaVeda Integrated Traditional Therapies®, Thai Yoga, Native American Medicine and Ceremony, Ayurveda, Yoga Therapy, Holistic Health, Natural Medicine, Holistic Gynecology and Women’s fertility Issues. She has completed over 2,000 hours of extensive training and education including clinical practice. She has obtained Beginner, Intermediate and Advanced Practitioner Certifications in SomaVeda® Thai Yoga Therapy and has personally apprenticed under Aachan, Dr. Anthony B. James DNM(C), ND(T), MD(AM). January of 2016: Tampa, FL Khruu Arianna Coe graduated with Honors the SomVeda College of Natural Medicine, Doctor of Sacred Natural Medicine Ayurveda (DSNM(P)/ Traditional Naturopath). She simultaneously received a Doctorate in Monastic Medicine from the Pan American School of Natural Medicine, Nevis West Indies. Khruu, Dr. Coe is also a Director, co-founder and Medicine Elder of the Native American Indigenous Church of Humiovi (NAICH), and Thai Yoga with Arianna. Additionally, Arianna Coe is an Ordained Minister and Medicine Elder of Native American Indigenous Church of SomaVeda (NAIC), Brooksville, FL. Arianna has additionally received Certified Teacher in SomaVeda® Thai Yoga Therapy and Ayurveda. Currently Director of Patient and Clinical Services at the Native American Indigenous Church of Humiovi, Knoxville, Tennessee. Chief Instructor SomaVeda® Integrated Traditional Therapies® Indigenous Thai Yoga and Traditional Thai Massage Certificate program. Counsels and co-facilitates treatment using Native American Spiritually based and Natural Medicine protocols in the clinic with Dr. Anthony James. Senior Staff SomaVeda® Teacher at the SomaVeda College of Natural Medicine, Brooksville, FL. An Ordained Minister/ Pastoral Medical Advisor and Counselor for the Native American Indigenous Church (NAIC). Arianna is also an Ordained healer, minister and practitioner of Ministry Therapeutica (Religious Therapeutics) whose systems of beliefs, practices, and teachings on health, healing, and medicine are transcendental (supernatural); associated with ancient, hidden, initiatory, and/or extant spiritual paths and metaphysical traditions that are preserved in the ancient wisdom schools. As an ordained minister Arianna has responsibility to perform all services of the church. This includes spiritual counseling, healing work, readings, performing weddings, baptisms, funeral services, and other traditional religious roles. 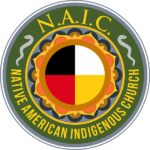 Membership Director and membership Administrator for NAICH, Inc. a State of Tennessee, IRS compliant Not for Profit, IRS 501(c) 3 Religious/ Native America Indigenous Church Organization. Handles all day to day membership related administrative roles for NAICH. Arianna Coe is Co-founder and Senior Instructor of the NAICH: Thai Yoga Center, located on a 2.5 acre residential training facility in Knoxville, Tennessee, home to NAICH Church, Seminary and Clinic, as well as Director of Education: 2004 Bays Mtn. Rd. Knoxville, TN USA Tel: (865) 660-8895. Please note: We do not see or provide services to the Public. Private specialized ministerial services and or counseling provided exclusively by and to NAIC Authorized members. Active NAIC/ NAICH APM membership required for any and all consultations and or services, exchanges etc. Has professionally co-presented over 24 individual professional certification seminars to date in SomaVeda®,Traditional Thai Yoga and Thai Traditional Medical Nuad Therapy. 1) Certified Thai Yoga Practitioner Program’s (CTP1, CTP2, CTP3, CTP4, CTP5) are individual 200 hour intensive residential training programs at the beginner, intermediate and advanced level’s of practice. CTP programs are the most comprehensive professional certification programs for Ayurvedic Thai Yoga currently available in the US. To date more than 20, 000 students have completed one or more components of the CTP’s. residential, professional Teacher training and certification program. 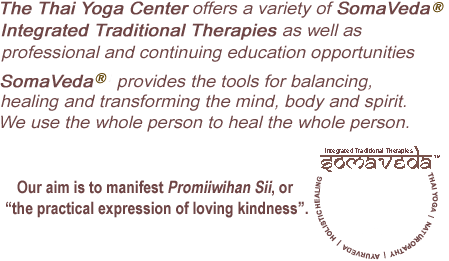 4) The Doctor of Natural Medicine/ Doctor of Naturopathy (ND) Diploma Program. A four year Doctoral program co-facilitated with the Pan American College of Natural Medicine (Nevis, West Indies). The initial 1400 hours in this 5200 hour program are on-site in the US. The balance of hours are in distance learning environment with residential clinical requirements and graduation via the Pan American school and campus.